Smoked Salmon Waffles may sound odd at first, but try it and you’ll quickly realize why it’s a thing! 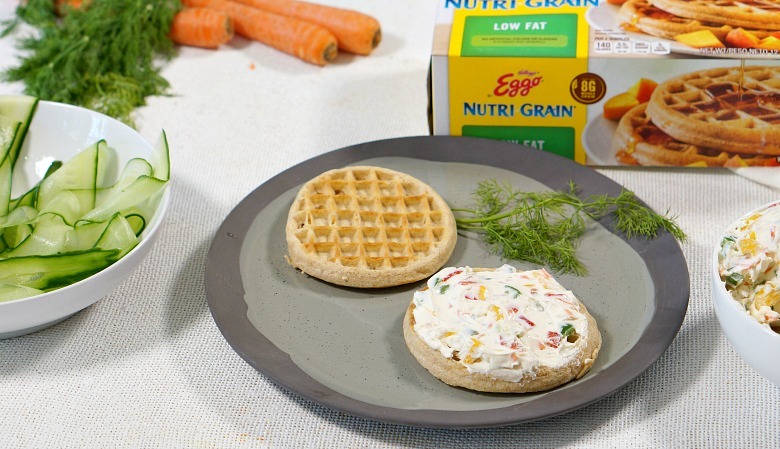 Whole grain waffles topped with veggie cream cheese and lox is a major win for savory breakfast lovers. We think waffles just might be the new toast for 2019! Like every mom across the world, I vowed to lose the baby weight, get back to exercise and eat healthy in 2019. It’s been about a month, and I’m holding on… with every last bit of will power I have. There have been a few “whoopsies” on the diet front. And, chopping off the end of my thumb put a halt on exercise for a week, but I’m still optimistic that 2019 is my year for conquering goals! With or without the end of my thumb. I’ve found that making good decisions at the start of my day helps carry me strong for whatever else comes my way. I like something savory. And with protein, because if I’ve got a morning workout, I need a breakfast that will have me feeling strong. It was with this in mind that I created this Smoked Salmon Waffles breakfast. Click the image above to shop for ingredients. Sure, it sounds odd, but everything on these Smoked Salmon Waffles makes good sense. Because toast is so 2018 (and I rarely have fresh bread in the pantry), the base of our breakfast begins with Kellogg’s® Eggo Nutri-Grain Low Fat Waffles. Why? Because we ALWAYS have them in our freezer. My kids are waffle-monsters. With 8 grams of whole grain, lots of fiber, and colors and flavors from natural sources, Eggo Nutri-Grain Low Fat Waffles are a staple for my family. We’re topping our toasted waffles with a homemade veggie cream cheese. 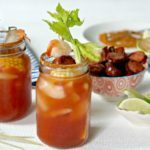 I love the combo of fresh bell peppers, carrots and garlic in this recipe, but if you want to add something else, go for it! Schmear a good amount on top, then load ‘er up with your favorite smoked salmon and julienned strips of cucumber. How do you have time Smoked Salmon Waffles in the morning? Keep Eggo Nutri-Grain Low Fat waffles in your freezer like I do! They take just minutes to toast. The homemade veggie cream cheese can be made days in advance. Just refrigerate until ready to use. 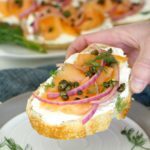 Pre-packaged smoked salmon is naturally preserved, so buy several packages at once and you’ll always have some on hand for these Smoked Salmon Waffle toasts! Another huge time saver? 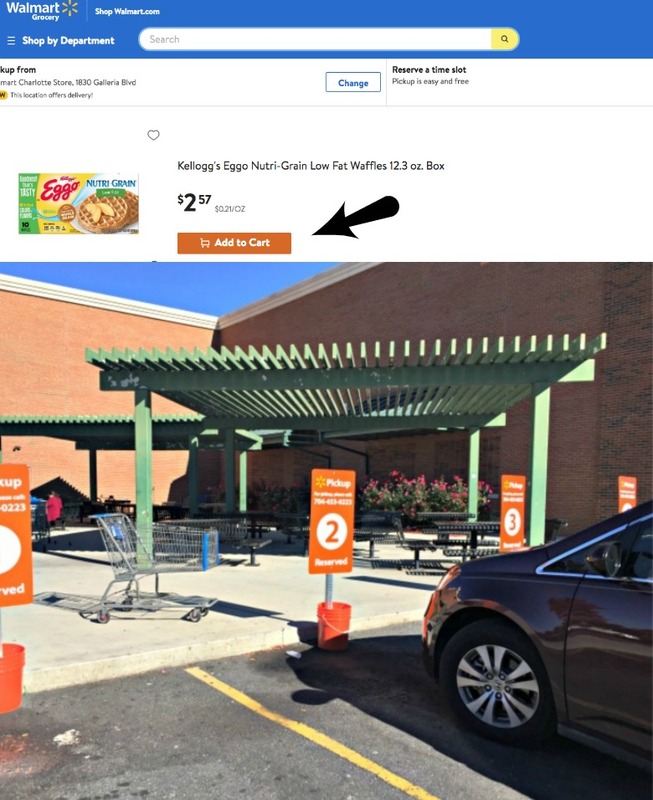 Walmart’s Online Grocery Pickup Service. Shop online, schedule a pick up time, and an associate will bring your groceries to your car and even load them for you. I’ve found I can do my grocery shopping while cooling down on the treadmill. Talk about multi-tasking! Smoked Salmon Waffles may sound odd at first, but try it and you'll quickly realize why it's a thing! 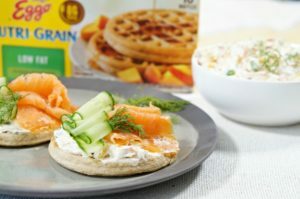 Whole grain waffles topped with veggie cream cheese and lox is a major win for savory breakfast lovers. We think waffles just might be the new toast for 2019! Beat cream cheese, salt, oregano, dill and garlic until whipped and combined. Stir in veggies. Use immediately or store in an airtight container in the refrigerator. Place frozen waffles in the toaster and cook until golden. Spread cream cheese on top. Layer with cucumbers ands smoked salmon, and a sprig of dill if desired. 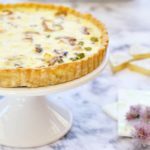 Need some more savory breakfast inspiration? 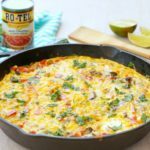 I’m also loving my Spring Veggie Frittata recipe (eggs always make me excited to get out of bed) and this Chorizo Shakshuka recipe (because eggs & chorizo!!). Save our Veggie Cream Cheese & Smoked Salmon Waffles recipe to your Breakfast Pinterest Board!